One of the wardens went in to investigate. Let me get right to the point. “Annihilation” isn’t exactly an easy SF. This horrifying SciFi can join the group of “the more intellectual looking SF films” where “Arrival” can be found as well. The more subtle form of SF, where you wonder all the time what is actually going on (just like the protagonists in this movie). And in the end, you still have a lot of questions. In terms of imaging, it looks like “Predator” mixed with influences from “Invasion of the body snatchers“. And it all takes place in a giant soap bubble. One moment the group of five women stumbles through a jungle where they are attacked by grotesque, mutated predators. The next moment it looks like a fairytale forest with strange, colorful vegetation and exotic flowers. I guess this group of women doesn’t know exactly what they are looking for. To be honest, they are completely lost and their sense of time and place is off. “The Shimmer” is a no go zone. It all starts with the impact from a meteorite, close to a lighthouse somewhere off the coast of the USA. And before Lena (Natalie Portman) realizes it, her husband (an American soldier who was MIA) is back sitting with her in the kitchen, she’s taken to a military base and she’s informed about the mystery that now exists after the incident with the meteor. After that impact, a huge zone has arisen, which they call “the shimmer” and where no one has ever returned from. Except for her husband, who came back in bad shape. This first part is already difficult to get through. It’s terribly slow with a lot of flashbacks. Not exactly easy to follow, but fascinating enough to arouse curiosity. Netflix tries to be a better SyFy channel. This is yet another original SF that Netflix tries to launch after “The Cloverfield Paradox” and “Mute“. And this time it’s exclusive to the viewers of Netflix because you can only see it in a limited number of cinemas worldwide. Maybe that’s a point of discussion. Wouldn’t it be better to watch this movie on a big screen? Because the scenery looks exceptionally beautiful at times. And it’s also very exciting and super mysterious. The footage they see on a camcorder looks bizarre. The discoveries they make at the military base are really frightening. No surprise that there are some who want to pack their bags as quickly as possible. The only question is where to go. Disorientation and mutual mistrust aren’t exactly helpful aspects. And when they start to encounter all kinds of murderous creatures, there’s the obvious comparison with certain action-packed scenes from the “Alien” series. I’m a Netflix Originals fanboy. 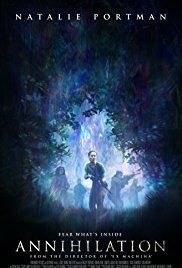 “Annihilation“, a film directed by Alex Garland who’s responsible for the magisterial film “Ex Machina“, can certainly be called successful. Maybe it’s a tad too complicated and you scratch your hair several times. Yet this film is unique in its way and as a viewer, you can interpret it in your own way. I wouldn’t call it a masterpiece though. The group of women who volunteered for this expedition may look like the jungle version of those that hunted other ghosts in “Ghostbusters“. But this film is of a different level and certainly not as disastrous as the latter. This quirky SF has made me an even bigger fan of the Netflix Originals.